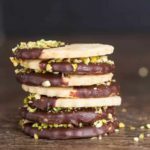 These pistachio baileys shortbread cookies with a chocolate baileys glaze and pistachio dust make a great dessert for Christmas, Valentine's day and even Easter. 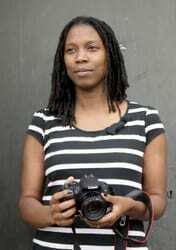 Last week I was faced with a rather tough decision. The sensible part of me knew I HAD to sit down and finally do that pesky tax return. The overexcited, foodie part of me knew I just HAD to drop everything and make these pistachio bailey shortbread cookies with a chocolate baileys glaze all completed with some pistachio dust. Guess which part won? I mean, it is Baileys pistachio shortbread cookies with a chocolate Baileys glaze. Do I need to say any more. 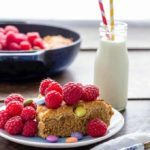 They are buttery, crumbly, the right amount of sweet, with bites of pistachio and a baileys flavour in every little mouthful. These are going to be one of my go to treats for Christmas, Valentine’s Day and many other celebrations. You know what? I think I will just make myself another batch of these shortbread cookies along some warming chai tea, lock myself away for a couple of hours, loose myself in excel spread sheets, invoices and get a handle on that tax return. For other recipes with Baileys pleace check out my baked Bailey doughnuts with a Baileys glaze, Baileys fudge from Foodie Quine, Baileys salted caramel and fudge cream pie from Munchies and Munchkins, Baileys marbled chocolate ice cream from Tin and Thyme and Oreo and Caramel Cheesecake from Tinned Tomatoes. 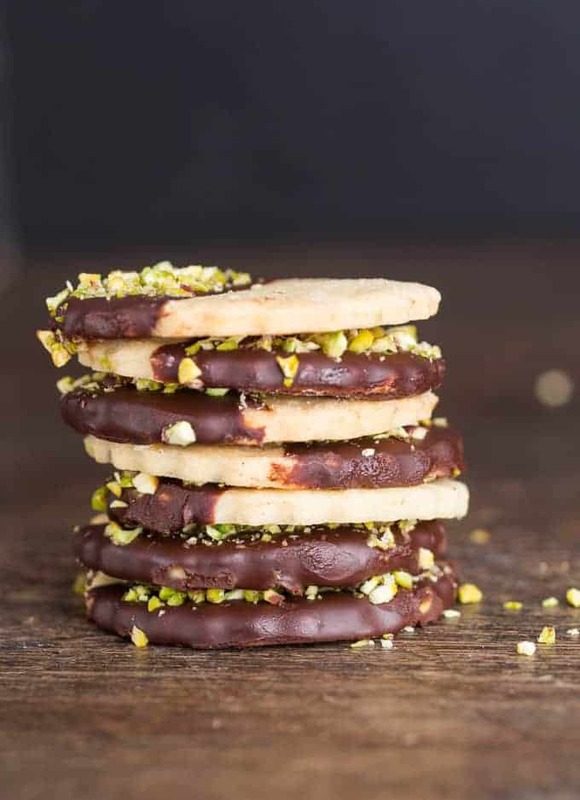 Don't forget to tag #recipesfromapantry on Instagram or Twitter if you try Pistachio Baileys Shortbread With A Chocolate Baileys Glaze! It is really, really awesome for me when you make one of my recipes and I'd love to see it. You can also share it on my Facebook page. Please pin this recipe to Pinterest too! Thank you for reading Recipes from a Pantry. 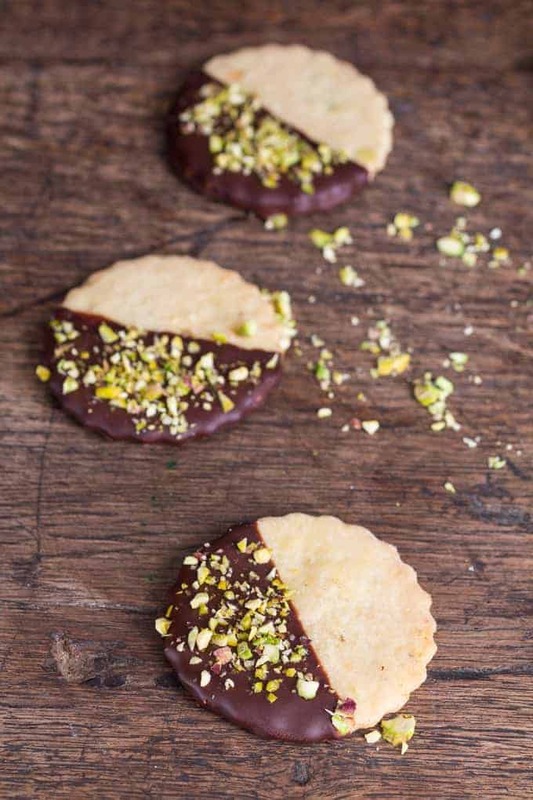 These pistachio baileys shortbread with a chocolate baileys glaze and pistachio dust make a great dessert for Christmas, Valentine's day and even Easter. Add the butter and sugar to a large bowl and cream together using an electric hand mixer till the mixture is light and fluffy. Mix in the orange juice and Baileys. Then add in the flours, chopped pistachios, salt and mixed spice and mix until you get a soft dough. If the dough is a little bit sticky then add in a tbsp or two of flour. Split the dough into two and shape each one into a disc, wrap in plastic wrap and chill for 1hr minimum. Take the first disc of dough from the fridge, roll it out on a lightly floured surface till it is about 5mm thick and then cut into your desired shapes (I use a 6cm diameter cutter) and lay on a lined baking sheet. Quickly scoop up the excess of dough re shape roll out and cut again. Repeat with the second disc of dough. You can freeze some of the cut shortbread at this stage. Bake the shortbread for about 12 mins until they are lightly golden. Make the glaze by melting the chocolate and mixing in the bailey. 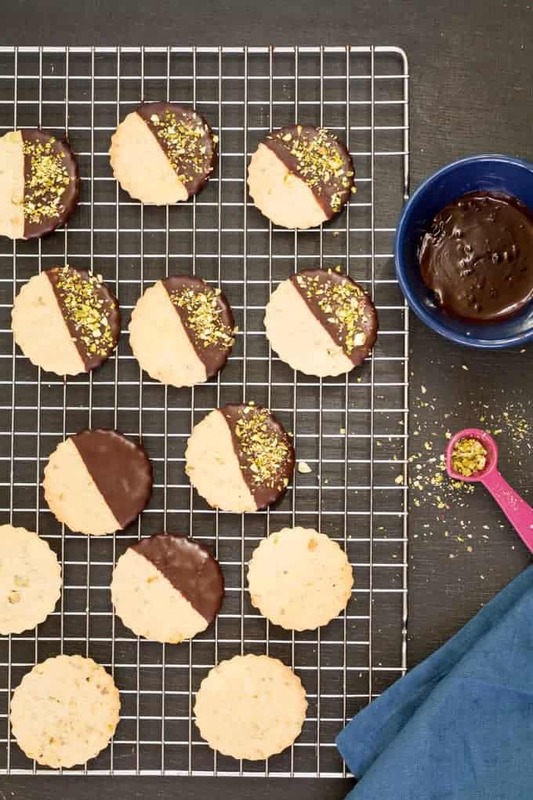 Dip half of each shortbread cookie into the chocolate Baileys mix, let the excess chocolate drip off, sprinkle on some pistachio dust and let the chocolate harden. You have no idea how much do I love Baileys! These cookies sound and look amazing, pinning this to try later! What a classy bake! I made chocolate dipped shortbread biscuits last year for edible gifts and they went down a storm. I’m really loving the flavours you’ve put together with yours. If it has Bailey’s in it then it gets my vote!! I love the fact that you link baileys both in the cookie and the glaze! Christmas just wouldn’t be Christmas without some Baileys! Oh my goodness those looks amazing. What an awesome idea, Thanks for linking to me too. 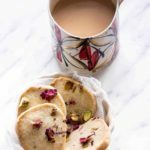 Chai and these biscuits is the only way to do a tax return in style! 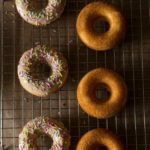 Those look fantastic, three for me please with a cuppa! Usually our Bailey’s doesn’t get as far as the recipe 😉 We do like to sip on it so I’ll just get an extra bottle and try out the recipe. It sounds delicious. Paperwork blah. Hate it!! So much nicer to be pottering around the kitchen. I adore Baileys, but can’t really drink alcohol due to medication. So sneaking it into recipes is such a bonus for me. Love everything about these, want one now!! Sammie. Did you say Baileys? Yum! These cookies look heavenly! I had no idea what Bailey’s was until last week and even found they have an alcohol free range too. Since I can’t get it locally but still love the recipe I’ll use a suitable alternative. Thanks for sharing these pretty and delicious looking cookies. What a delicious cookie to have on any holiday dessert table! Yum! 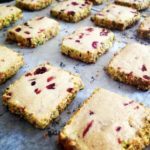 I’m a big fan of pistachios, these cookies sounds incredible and are so pretty and festive too! I am totally adding these delicious cookies to my Christmas baking list! I love everything about them: pistachio, Baileys and chocolate…OMG! I think you made the right decision on this one by making the awesome cookies first. Taxes are far more fun with tasty cookies to nibble on while you work! These look just like these amazing cookies I had in Starbucks the other day, I am going to have to try making them myself. shortbread and baileys both my favourite and together heaven. These look delicious, perfect post Christmas treat methinks!